by clicking on the cart icon below. MASTERTECH DEMONSTRATES HOW TO TUNE UP AN OLDER SMALL MOTOR. 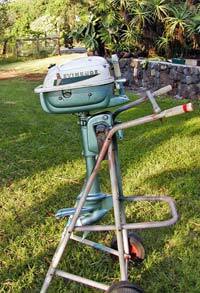 DO you have an older small Evinrude or Johnson outboard from 3 thru 25 HP that needs a little help? or perhaps you would like to get a good small motor without spending from $1300 up for a new model? Then you have come to the right place. 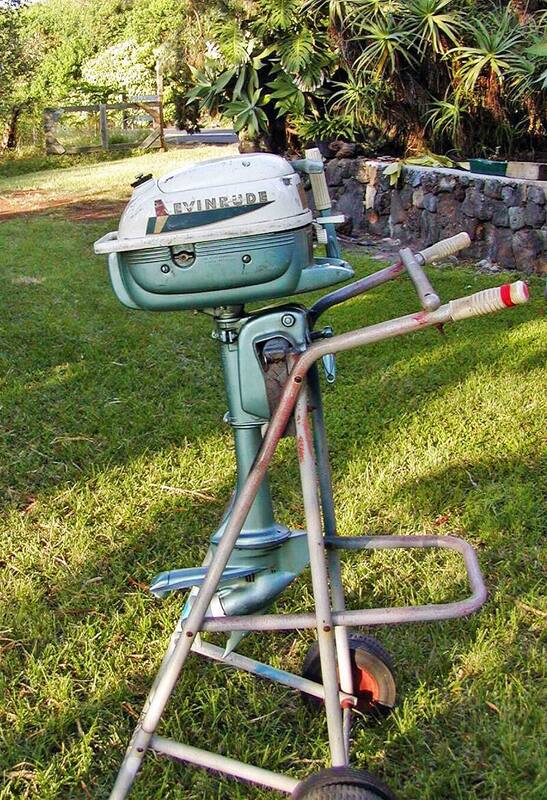 We will go through the complete procedure to do a major tune up on a small motor, in this case a 1962 Evinrude 3 HP I was lucky enough to win in an E-bay auction. The seller said it didn't run but I could see from the images provided that it was in pretty good condition. Turned out to be almost unused! This particular model was built essentially unchanged from 1951 through 1967 and as a 4 HP up into the 90's. You couldn't ask for a better trolling motor. Where do YOU get one? E-bay and other auction sites have motors up for sale all the time. Yard sales, flea markets, even your local dealer may be happy to sell you an older motor they don't think is worth repairing. 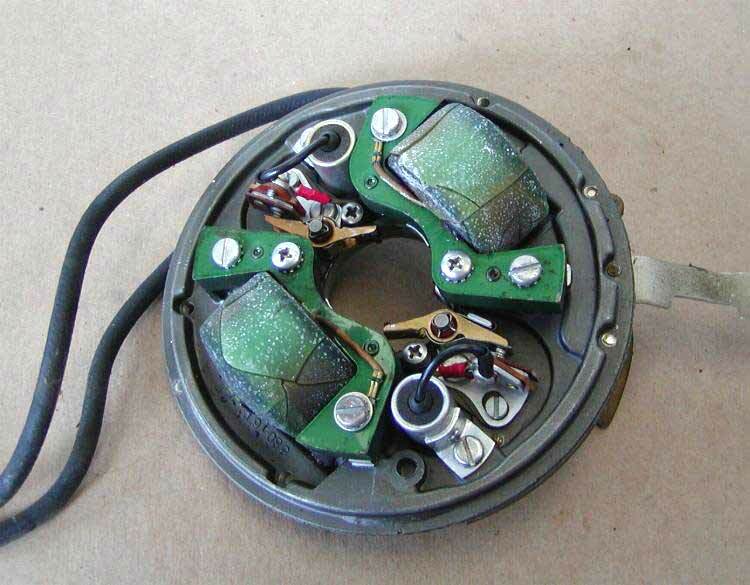 Use good judgment, don't buy a motor that is worn out! Generally the nicer looking ones are in good shape. These are the components we will be using to get this little jewel into perfect condition. 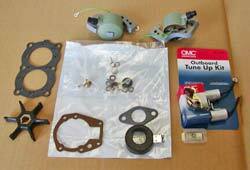 All these parts will cost you just a little over $125.00. The entire project should only take you a Sunday afternoon, and will reward you with a motor that runs better than new. Most of the small pictures are active links to full size photos to help you along. Just click to look, they will open in a new browser window. Feel free to print out any of this info FOR YOUR OWN USE ONLY!! To begin you will need ordinary QUALITY hand tools, a feeler gauge, flywheel puller, torque wrench, some OMC Engine Tuner or Mercury Engine Cleaner, a gallon or so of cleaning solvent or paint thinner, moly lube, silicone dielectric grease, a CLEAN workbench. All the parts as well as the entire motor should be rinsed clean with the solvent, cleanliness is imperative. An otherwise good job will be ruined by grunge. Be sure to work in a well-ventilated area and keep your hands as free from cleaners as practicable. The first area we will approach is the ignition system. 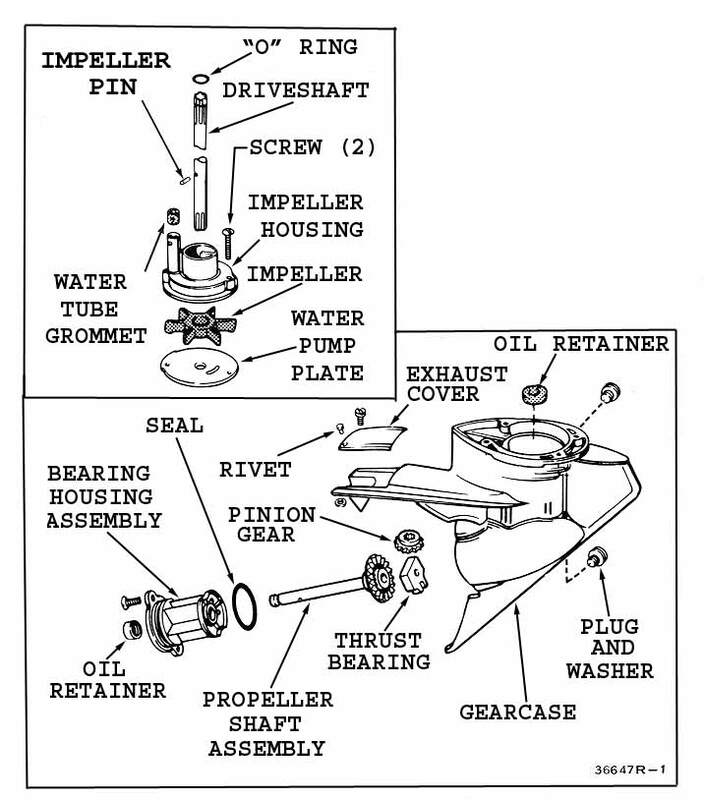 OMC used a "Universal" magneto on most all small outboards from the early 50's right on up to just a few years ago. Over time the components on the earlier models will deteriorate requiring replacement. Fortunately these components are very inexpensive. This image shows the proper type of flywheel puller you need to remove the flywheel. This can be rented form your local tool rental as a "steering wheel" puller. 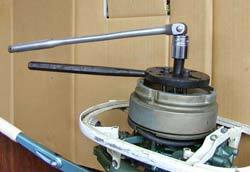 DO NOT try to use any kind of puller on the outer diameter of the flywheel as it will bend and destroy it. Pictured is the stator plate removed from the powerhead, on the bench. Simply unhook any advance linkages, unscrew 4 Phillips head screws closest to the center of the plate and lift it off. As you can see in this picture the original ignition coils on this motor have deteriorated and cracked insulation rendering them useless. You should replace these even if they look OK as the newer ones we sell are far superior to OEM. The powerhead with the magneto removed. Clean the breaker point cam and the crankshaft taper with acetone or lacquer thinner to remove all traces of oil. 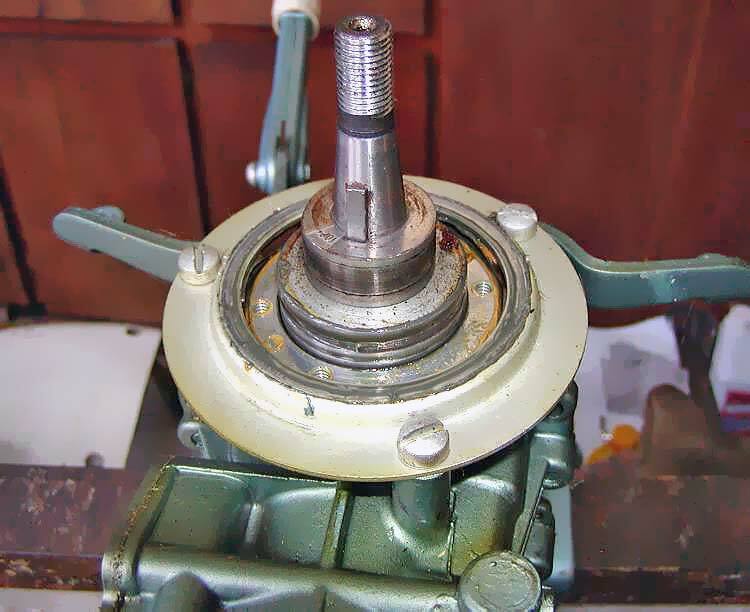 The crankcase head and the stator plate support should be re-lubricated with molybdenum lubricant to help keep the plate from rattling around as well as providing a good ground. IF this area is full of grunge take it apart and clean and regrease. Use locktite on the screws. Showing installation of the new coils. Lubricate the ends of the coil wires with some silicone grease like that used on new high energy ignitions,install the small rubber boots and "roll" the coil onto the wire, making sure it slips in and makes good contact with the pin in the coil. Align the coil heels with the machined surfaces on the stator plate. 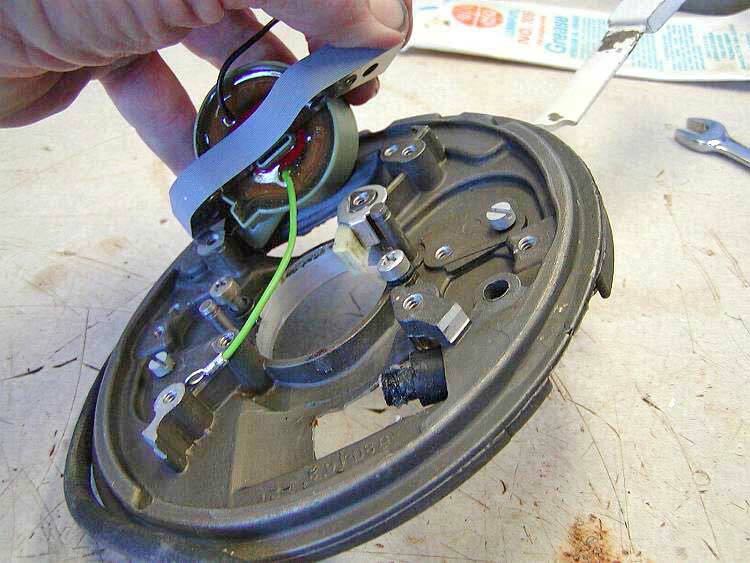 This is VERY IMPORTANT as error here could cause the flywheel to strike the coil heels, ruining the entire magneto. Be sure to install the cam wick under the coil on the irregularly shaped boss. This lubes the breaker point arms, without it they will rapidly wear away. To set the points, move the cam until the point arm follower is touching the cam at the "TOP" embossed thereon. Set them at .020 with a feeler gauge cleaned of all oil with denatured alcohol, acetone or lacquer thinner. The feeler gauge should slip out from between the point faces with a light resistance and the arm should not appear to move when the gauge is removed. Care taken to set the points exactly the same will result in a strong spark and a smooth running engine. 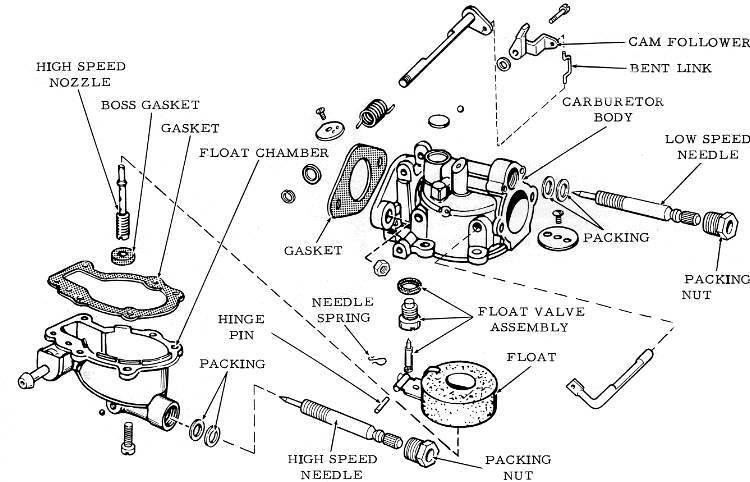 to continue with the carburetor overhaul, head gasket and water pump impeller replacement. 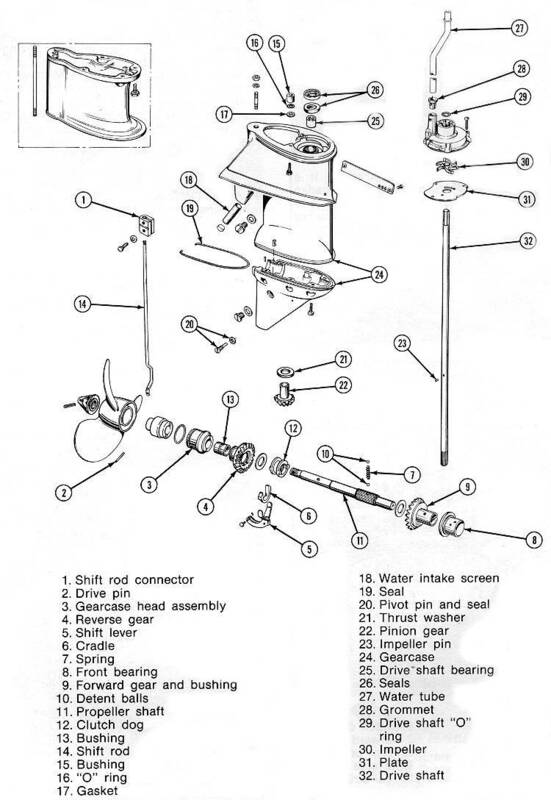 I HIGHLY RECOMMEND you obtain an OEM model-specific service manual to help you. We have most available RIGHT HERE at Mastertech.